Location : Old Goa, 9 Km from Panaji, in the same compound as the Se Cathedral. Main Attraction : Elements of Hinduism in the church. How to reach : Local transport in Goa, which is easily available from anywhere. The Church of St. Francis of Assisi is sited in the same complex, where Se Cathedral is situated. The church is a stunning building, constructed during 1517-1521 AD. A church sanctified to the Holy Ghost was built in 1521 and was later demolished. The present church was then built on the same spot in 1661, maintaining only the foyer of the earlier church. There used to be an educational institution within the church. The Portuguese government closed the convent in 1835. 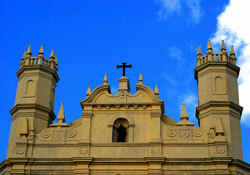 The Archaeological Survey of India renewed the church into a museum in 1964. The church displays relics and paintings of Hindu temple sculptures from Goa. The Church of St. Francis of Assissi has been designed very finely. The church is much smaller than the Basilica of Bom Jesus and the Se Cathedral. It is painted heavily and one finds generously carved altars. The characteristic is one of subdued pride. A painting on the ceiling near the doorway has a unique Indian feel to it. The architecture is a blend of the Tuscan style on the outside and the Mosaic-Corinthian style on the inside. The internal area of the church is beautifully decorated with the scenes and depictions from the Bible and wall carvings show very fine and intricate floral designs. The position of the portico holds the statue of St. Michael. A wooden sculpture of St. Francis of Assisi adorns the pedestal in one of its chapel. A heavily carved forte with tabernacle supported by four evangelists can be seen in the main altar. The tabernacle was used for displaying the holy sacrament. The main altar lies above it. Two huge statues of St Francis Assisi and the other of the Jesus on the Cross are placed above the tabernacle.